My family lives near the bottom of Heartbreak Hill, named for its location in the Boston Marathon. Photo by Jerome Gerrior Racing. Some rights reserved. For a while, we were under the false impression that we, in fact, lived at the top of Heartbreak Hill and we would yell “congratulations! The hard part is over!” Oops. Sorry. (In our defense, the youth race is called “Heartbreak Hill Race,” even though it’s on one of the earlier “Newton Hills”). Every year, my parents take a walk after the Passover Seder. One year, Passover fell out on Patriots’ Day. My parents took their walk late at night, long after every runner had finished. The streets though, were still littered with paper cups and orange peels, signs that at some point earlier, all along the route, people had held out cups of water and orange slices for runners to grab as they came past. As my parents walked down the street, a truck driver pulled up, clearly completely lost. My parents gave him directions, and the truck driver looked up and down the litter-strewn street. “Man, you guys sure know how to throw a party,” he said. I think of that story every year, my parents hosting a 26.2-mile party, and laugh. I told that story to some friends last night, adding that I remember learning the proper way to hold out a cup of water: palm curled just enough so that the cup doesn’t fall out of your hand, but open enough so that when a runner comes by, he or she can grab it from you without slowing. Every year people run past, right near my parents house. We cheer them on. We yell encouragement. We offer water or oranges. We see neighbors we haven’t seen in a while and buy lukewarm lemonade from little kids who have set up a stand in their front yard. Because, I guess, that’s what you do, when someone runs a marathon in your neighborhood. Today was different. Today, I was on the T, trying to get to my parents’ neighborhood, when Hynes Convention Center T station was evacuated. The announcement came three times, uncharacteristically clear, and very calm. “This is an emergency. Please leave the station.” No one on the T itself moved, since it wasn’t clear if we should get off, or if the best way to leave the station would be to stay on the T. There were murmurs of confusion. And then, someone must have realized what was going on. The fourth announcement came. “This is an emergency. Please empty the train and leave the station.” And so we did. People wearing Boston Marathon medals and wrapped in “space blankets” limped a little as they headed back up the steps. Others gave them sympathetic looks. Once outside, police directed us away from Copley, but had little other information to offer. So we walked. Alongside, but in the opposite direction of, the Marathon runners still heading towards the finish line. “Good job! You’re almost there!” spectators yelled, cheering on strangers. We steered clear of the emergency vehicles racing down the street and of the cops on bicycles who easily made it clear that they were no longer just policing an ordinary race. At one point, one of the cops along the marathon route started telling runners he was going to direct them to one side so motorcycles could pass. Everyone moved aside but kept running. It took a few texts from my family and then a stop in Dunkin Donuts to watch the news for me to fully grasp what was going on. I kept wondering if there was anything of use I could have done had I had a press pass, (I would have had to have crossed many police barriers to have gotten close to the scene). Later, home, I read that people who finished the Marathon as the bombs went off kept running to go give blood. That emergency personnel lept the barriers between the spectators and the runners so they could reach the wounded; they ran toward the explosions. People opened up their homes to stranded runners and checked in with people they knew. I was, throughout the day, completely impressed with how helpful, calm, and informative, cops along the Marathon route were. 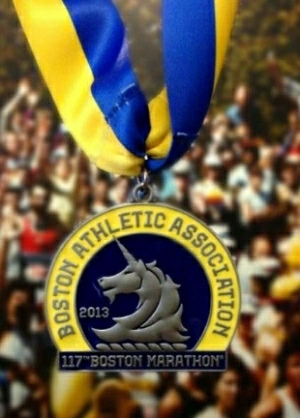 It didn’t occur to me that anyone would ever have a reason to attack the Marathon. Even when the train had been evacuated, I assumed there was some sort of threat, but that it would turn out to be unsubstantiated. Because, who would do that? But we step up. We offer water, and shelter, and blood, and information, and encouragement, and prayers, and comfort. Because, ultimately, that’s what you do when someone attacks a marathon in your neighborhood. This entry was posted in Uncategorized and tagged Bombings, Boston, Boston Marathon by leorafalk. Bookmark the permalink.